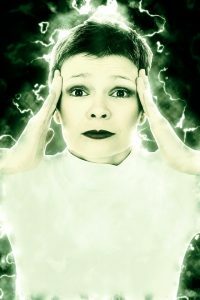 Home › Headaches › Do you suffer from Tension or Migraine headaches? TMJ pain? Do you suffer from Tension or Migraine headaches? TMJ pain? If you suffer from any of the above, you are probably all too familiar with over-the-counter and prescription reme­dies that can only offer you temporary relief (if any relief at all). Frustrating, to say the least. Wouldn’t it make more sense to treat the cause? Dr. Lisa Marie Samaha of Port Warwick Dental Arts believes so, and knows the answer to head and neck pain may be in your bite. No matter what, when it comes to caring for her patients, Dr. Samaha is committed to diagnosing and treating the cause—rather than medicating the symptoms—of any disease process she encounters in her patients. Although biting and chewing seem like relatively effortless processes, these functions are made possible by a complex series of muscles, ligaments and joints working together to keep your upper and lower jaws aligned. A misalignment between the upper and lower jaws can be caused by accidental trauma to the face or skull, or simply from trauma occurring as far back as the birthing process. When a distortion has occurred, the movable lower portion of the jaw (called the mandible) must find and fit into the upper stationary portion of the jaw (the maxilla) during th chewing process. When any part of that alignment is off, the muscles and ligaments involved do their best to compensate and bring the jaws back into alignment. The associated twisting needed to make this happen can cause head, neck, jaw and even tooth pain. So if you have more headaches than you’d care to count and you’re tired of masking the pain with pre­scription drugs rather than getting down to the true core of the problem, make an appointment today to see Dr. Samaha for a diagnostic evaluation. Treating the cause rather than just the symptoms is a hallmark of Dr. Samaha’s patient care. There is no need to live with unnecessary pain for another day. ‹ Don’t hide your smile – SHOW IT OFF! Schedule a One-on-One Consultation Today! Newport News dentist Dr Lisa Marie Samaha Experienced cosmetic dentistry, dental implants, periodontal treatment and restorative dentistry in Newport News, Virginia for patients in the Hampton Roads area including Hampton, Acree Acres, Grafton, Seaford, Tabb, Carrollton, Yorktown VA and zip codes 23601, 23602, and 23606.